The History of Bees is a book I initially struggled to rate. I didn't dislike it, but neither did it truly thrill me. Taken individually, the three stories were interesting; however, the bringing together of the trio towards the end felt a little forced. It worked, but it read like an afterthought. I also never really formed a strong, deep connection with any of the characters, so I sped up my reading in the latter half, wanting to finish and know what would happen but not so invested that I wished to dwell on every word. In addition, there were frequent comma splices that made my inner editor cringe. There were enough of them that it didn't seem like they were merely typos that would be picked up in final proofing, and they were irritating and constantly pulled me out of the story. But that's just me, and I have an even lower tolerance for grammar issues these days than I used to. Ever since I started working as an editor, I find it hard to turn off that part of my brain when reading. 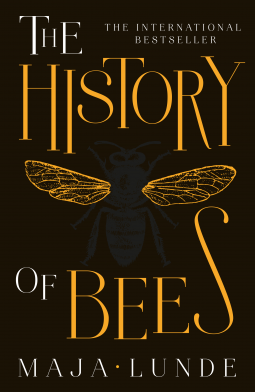 If you are someone who enjoys this style of literary fiction, with multiple period narratives, I'm sure you will find The History of Bees a pleasing read. It didn't tick all the boxes for me, but it still offered food for thought in terms of the current issues surrounding bees and was an interesting concept.